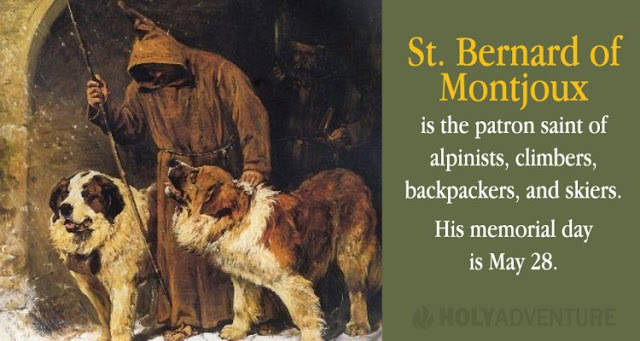 The St. Bernard dogs are named after him. Born in 923, probably in the castle Menthon near Annecy, in Savoy; died at Novara, 1008. He was descended from a rich, noble family and received a thorough education. He refused to enter an honorable marriage proposed by his father and decided to devote himself to the service of the Church. Placing himself under the direction of Peter, Archdeacon of Aosta, under whose guidance he rapidly progressed, Bernard was ordained priest and on account of his learning and virtue was made Archdeacon of Aosta (966), having charge of the government of the diocese under the bishop. Seeing the ignorance and idolatry still prevailing among the people of the Alps, he resolved to devote himself to their conversion. 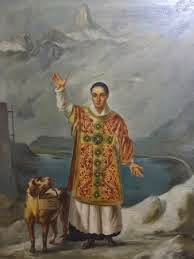 For forty two years he continued to preach the Gospel to these people and carried the light of faith even into many cantons of Lombardy, effecting numerous conversions and working many miracles. St. Bernard founded a monastery and hospice at the highest point of the pass, 8,000 feet above sea-level, in the year 962. A few years later he established another hospice on the Little St. Bernard, a mountain of the Graian Alps, 7,076 feet above sea-level. Both were placed in charge of Augustinian monks after pontifical approval had been obtained by him during a visit to Rome. These hospices are renowned for the generous hospitality extended to all travelers over the Great and Little St. Bernard, so called in honor of the founder of these charitable institutions. 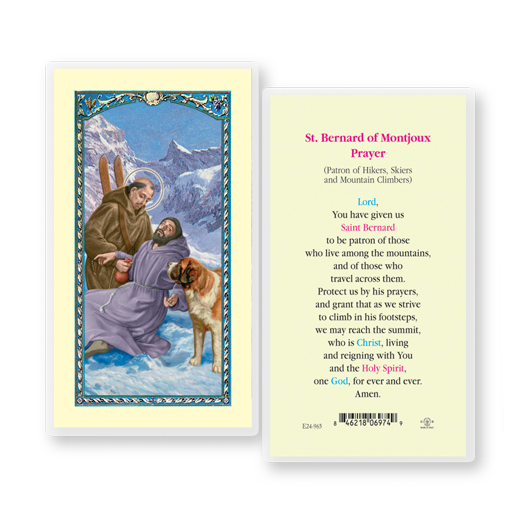 At all seasons of the year, but especially during heavy snow-storms, the heroic monks accompanied by their well-trained dogs, go out in search of victims who may have succumbed to the severity of the weather.